Son Andrew Gillies is on the left. 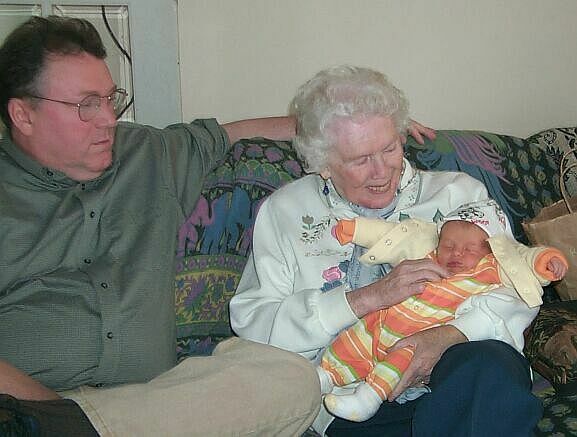 Martha Torrey Gillies, born in Philadelphia, PA to James Comegys Torrey and Anne (Culver) Torrey on July 30, 1919, died in Alterra Clare Bridge of Ann Arbor, Michigan on Tuesday, August 31, 2004. She is survived by three children, Anne (Franklin) Campbell of Mason, MI, Andrew Gillies of Ann Arbor, MI and Jonathan Gillies of Bridgeport, CT, five grandchildren, Anne, Peter and Meredith Gillies of Bridgeport, CT, Sam Gillies of Ann Arbor, MI, and Meg (Jeffrey) Campbell-Crawley of Mason, MI and two great-grandchildren, Toby Webb and Hazel Campbell-Crawley of Mason, MI. Martha received a bachelor's and master's degree in chemistry from the University of Pennsylvania. She was one of the first female chemists hired by Dupont and worked there in the Second World War developing parachute materials and paints. She was married in June of 1945 to Daniel MacGilvary Gillies, who died in 1993. Martha retired from her job to raise her three children. She and Daniel lived in various parts of the United States, following Daniel's job with Union Carbide chemical company. She led an interesting life, traveling to many places, including a year in China in 1939. She was very active in her church wherever she lived and also believed deeply in the importance of volunteer work. She was valued wherever she lived for her giving spirit. A memorial service will be held in the First United Methodist Church on State Street in Ann Arbor at 1PM on Tuesday September 7. Please send memorial gifts to Habitat for Humanity, where Martha was an active volunteer for several years.